Files that are stored in Swivle can be easily shared by using the Brand portal. This is done by sending a hyperlink (referred to as a 'Shared Link') to the recipient. This hyperlink gives that recipient access to only those files in Swivle that you share. (Figure: Files when viewing them in a Shared Link). 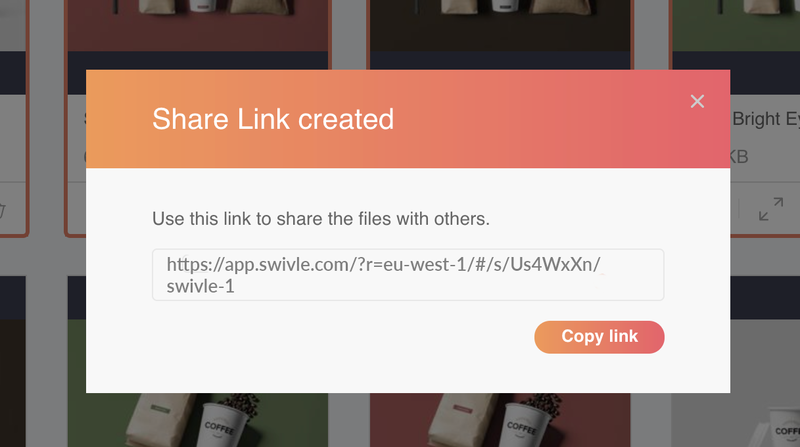 The Shared Link can be sent to anyone, including those that do not exist as a user in Swivle. No log-in is required to view the files. Share Links are automatically set to end 3 months after the creation date. In the Brand portal, created Shared Links cannot be edited. This means that once a Share Link is created in the Brand portal, you cannot change the name, the permissions or the date when it will expire. Note: If you have access to it, Share Links can be edited in the Pro client. 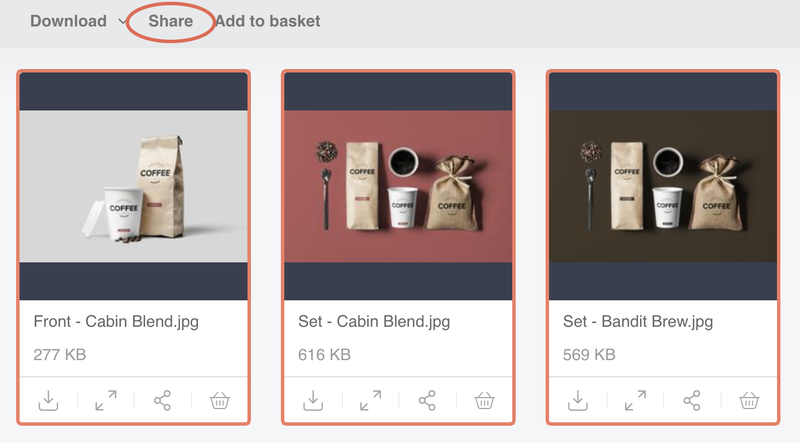 Tip: When sharing files that are stored in multiple locations, add them to the Basket first. 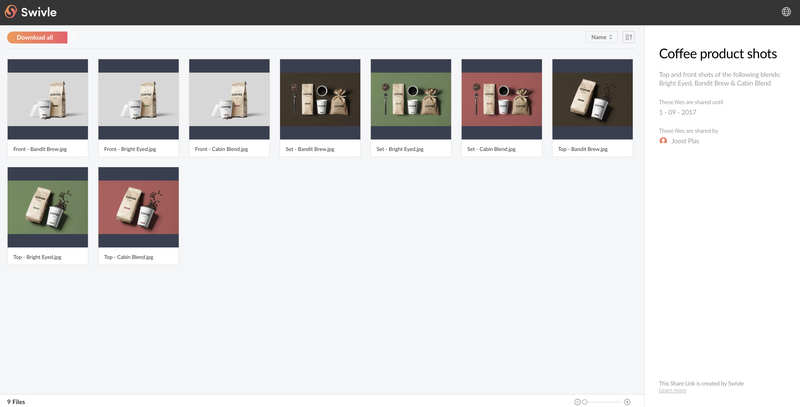 This way you can share them in one action instead of sharing files one-by-one or in small groups. 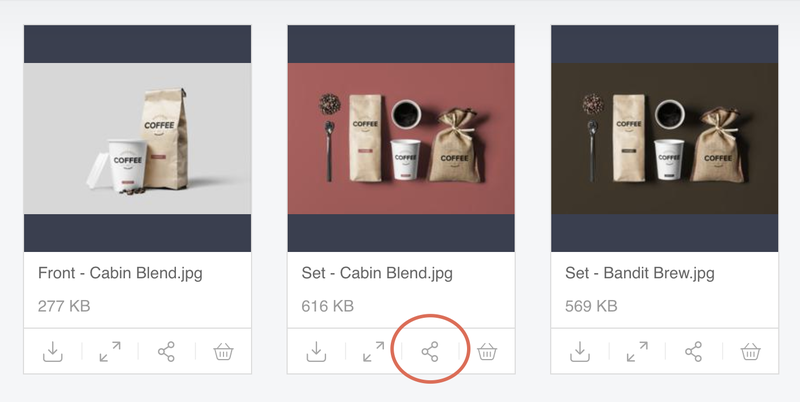 Figure: The Share icon in the thumbnail of a file. The Share Link is created and presented in a window. Step 3. Share the link in some way, for example by including it in an e-mail that you send to all users who you want to see the files.